Ruby is the red variety of the mineral species corundum or aluminum oxide Al2O3. Other colors of this mineral are called sapphires. So, rubies and sapphires are actually the same mneral. 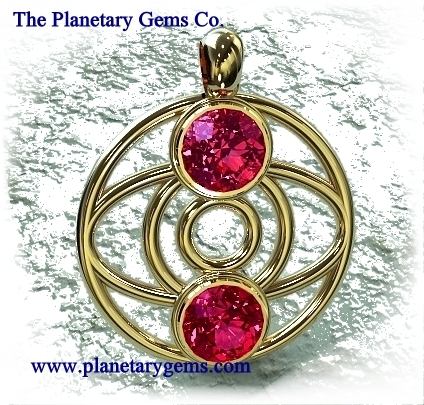 In Vedic astrology, the ruby is related to the planet Sun . The ruby gemstone is also known as Manik. Other names for the ruby are Manikya, Padmaraga and Shona-Ratna. The following ascendants will benefit from wearing a ruby or any astrological, ruby alternative gemstone (Upartna). Leo, Aries, Sagittarius, Scorpio. It should be set, ideally, in yellow gold. "Aum grinih suryaya namah" repeated 7 times at the time of wearing a Sun talisman. Creative, vital, resistant, determined and decisive. Successful activity, authority. Royalty, high position in administration. Cheerful outlook, good fortune, ambition to achieve great heights, brilliance, optimism, success in worldly affairs.